Once again I am writing about doing something I’ve never done in the kitchen before, roast beets. I just love beets, that earthy sweet flavor that is packed with goodness. Beets are something that I order when I eat out but have never made them at home. I saw them at the farmer’s market and decided I would give it whirl. Line a baking sheet with aluminum foil. 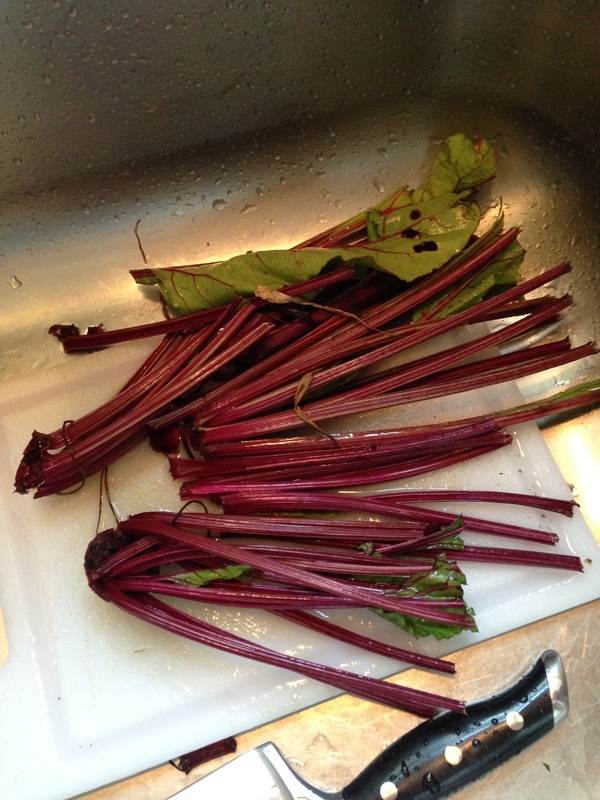 Cut off greens and the little pointy tip off the beets, scrub well. Coat lightly with olive oil and sprinkle with kosher salt. 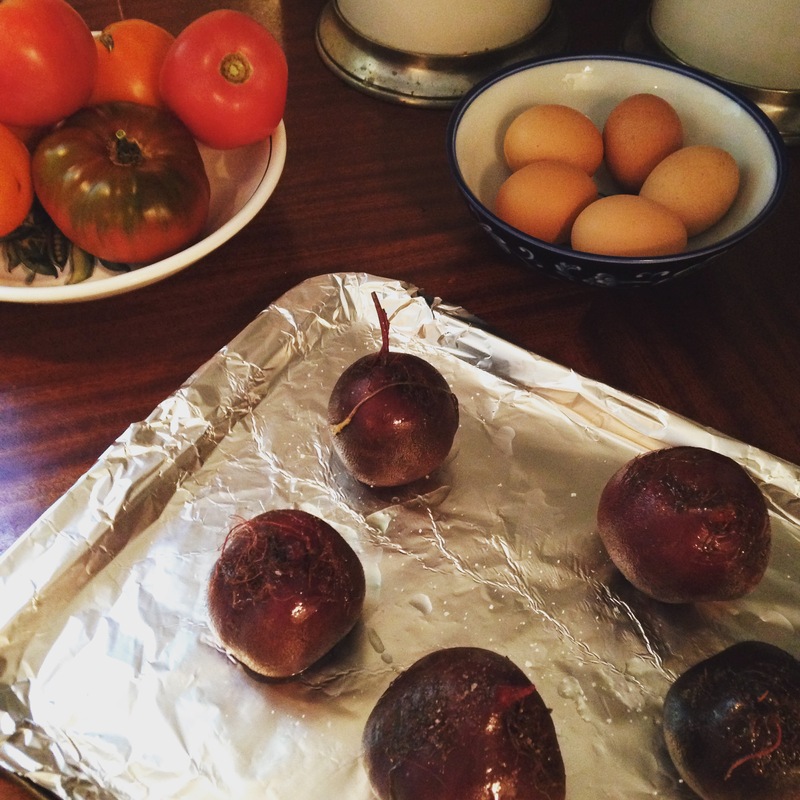 Place beets on baking sheet and cover tightly with aluminum foil. Place in the oven for 1 hour. To test for doneness a fork should pierce it smoothly, if not cook for another 15 minutes or so, it should not take more than 1 1/2 hours. Remove top cover of aluminum foil and let cool. When cool enough to handle you can peel the skin right off. It is a bit messy so you may want to use rubber gloves. The beets are now ready to use! I decided to make a salad with mine that I served with chicken breast, absolutely delicious, low-fat, low-carb and nutritious. 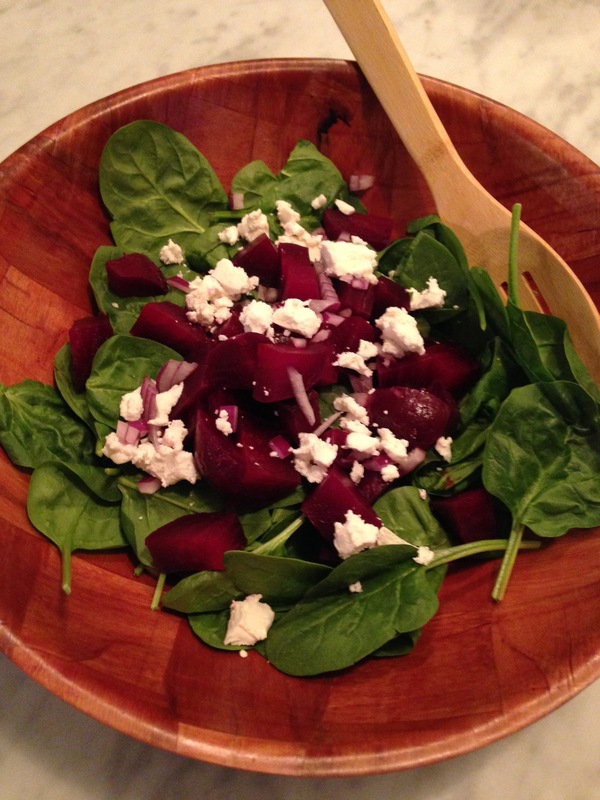 Place spinach and beets in a large bowl. Whisk together olive oil, vinegar, Dijon mustard, honey and red onions. Pour over spinach and beets, toss to combine. Top with goat cheese. And enjoy!